With innovation comes uncertainty. When we see something that is dierent to what we’re used to it can cause us to question it, seek validation, and educate ourselves before we can fully understand it. 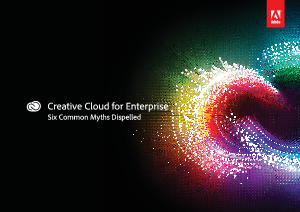 Download this short illustrated guide to uncover the six most common myths relating to Creative Cloud for enterprise, and dispel those myths in a clear and creative way. Although the guide is intended to address misconceptions about Creative Cloud for enterprise, you will find that many of the myths are common across all Creative Cloud offerings.